So, given the State of my TBR post that I shared earlier this week where I wrote about wanting to focus on reading my own books, it should probably be the case that I have no new books to show you today but, alas, I have new books. I ordered this paperback book before I made my plan to read my own books and had forgotten about it. I don’t think this will be on my TBR for long as I’m really keen to read it. This book has been on my wishlist since I first heard about it. I really wanted to get it in hardback but it’s around £20 so when the kindle version was a in the daily deal yesterday for 99p I snapped it up. This is another book that won’t stay on my TBR for long as it’s one I’ve been very much looking forward to reading. I had a lovely chat with Jen on twitter this week and she mentioned her book as asked if I’d like to read it. I’m trying not to take on too many review books at the moment but this one really interested me so I’ve added it to my pile. Hopefully it won’t be too long before I can read it but I do have quite a few review books to read ahead of it. I’ve kept hearing about this book on social media and it sounds like a fascinating novel, which I’ve been keen to read. I got an email from NetGalley this week saying that the publisher had approved my request so I’m hoping to read this very soon. This entry was posted in Book Meme, Books, ebooks, Stacking the Shelves and tagged Ayobami Adebayo, Books, Brian Hiatt, ebooks, J.L. 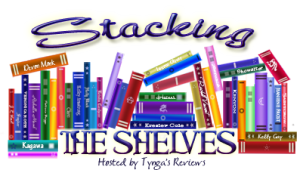 Gilmour, Ray Robinson, Stacking the Shelves. Bookmark the permalink. Same here… we can but try though! You are doing well in managing your TBR.I need to get back to mine but I currently have way too many ARCs which is not fun. I loved Stay with Me,I hope you will too.Have a wonderful weekend and happy reading. I’m slowly getting the ARCs under control but it’s taken me a while to do it. I’m being more strict with myself about the ARCs I request/accept now and that’s helped a lot. I’m looking forward to Stay With Me, I hope to get to it soon. Gosh, Electricity has been on my TBR pile for years. I’d forgotten about it until I saw your copy. I’ve had it on my wish list for so long and then I saw somebody talk about it on YouTube the other day and it made me finally get around to buying it. I hope to read it soon. I hope you get a chance to find and read your copy too. Actually, after I had posted my comment I had a look in my online library and it’s not there. Hmmm…..no idea what has happened to it! Oh no, I hate when that happens. I hope it turns up somewhere. I don’t think four books is an awful lot at all! And those do look interesting. I hope you’ll enjoy them. Thanks. Four books wasn’t bad – it’s just the fact that I’d decided to focus on my own books and then in the very same week acquired four more. I need to be better at resisting bookish temptation if I’m to get my TBR down. Great haul! All of these sound great, but Stay With Me sounds particularly intriguing. Have a great weekend and happy reading! Thank you. I’m looking forward to Stay With Me, I’ve heard only good things about it so far. Four books is okay! 🙂 40 might be more problematic! This week I bought The Loving Husband by C. Kent and Trading with Death, by Ann Girdharry. I guess I still have to work on my idea of not buying books! Happy reading! Four books wasn’t bad for the old me but it just felt like a bit of a fail when it was in the very same week that I’d posted about my TBR and how I wanted to focus on the books I already own. Ah well! I’ve got The Loving Husband on my TBR – it sounds good, doesn’t it? Happy reading to you too. I have the same issue…I started to say “problem,” but seriously, what could be problematic about more books? LOL. While I am focusing more on my own books, I still have new ones coming in. Maybe not as rapidly…or I could be in denial. Thanks for sharing. A Portrait of Bowie caught my eye. I do love memoirs (or biographies) of favorite celebrities. That’s very true – books aren’t ever really a problem… 🙂 I’m trying to read my own books this year so I just need to make sure that books I acquire arrive at a slower rate! I didn’t buy a new one but I went to get a library card in my new town (recently moved) and borrowed Heartless by Marissa Meyer. Looking forward to reviewing it on literaryweaponry.com So far I have loved it. I’ve not read any Marissa Meyer so I’ll make sure I read your review of Heartless. I wish I could go to the library, I always used to enjoy doing that. You definitely can’t go wrong with the Kindle Daily Deals! I find myself buying so many books when there are Kindle sales. 😀 You had a great week in books – not too many, but not too little! I hope you enjoy all of your new books. I agree – I look at the Kindle daily deals every day to see what’s on there and have had some great bargains. 🙂 Thank you, I hope you had a lovely weekend too. Trying to not but. I’ll fail, but holding fast for now. Interesting choices.